The cherry tomatoes just keep on coming! This was my first year planting them and I had no idea how much those few tiny plants were going to produce. Of course, they're wonderful in soups, salads and pasta; but there's nothing quite like a tomato tart. It might look a bit fancy, but to me it's just comfort food. 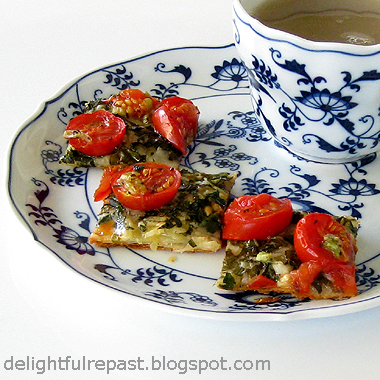 A larger slice makes a lovely first course, tiny slices make great HDs (hors d'oeuvre) or afternoon tea savories. I've made the tart with filo and pie dough as well, both delicious; but using frozen puff pastry makes it really easy (It's been ages since I've made homemade puff pastry--I'm not so averse to time-saving measures as I once was!). I usually make the tart with sliced medium-sized tomatoes, but this year I grew cherry tomatoes instead. My tomato tart makes even bland store-bought tomatoes taste the way they should, so don't feel you needn't bother if you're not a gardener. This time I made the tart with raw tomatoes, but if you have the time, giving them a bit of a roast beforehand takes out some of the moisture and intensifies the flavor. Just preheat the oven to 450 degrees. Rub some olive oil on a foil-lined rimmed baking sheet and place the tomato halves cut side up; cut side down, they will go from roasting nicely to stuck to the foil in the blink of an eye. Sprinkle with salt and pepper. Roast about 30 minutes, remove from the oven and cool slightly. 1 Thaw pastry at room temperature for 45 minutes. Preheat oven to 425 degrees. In small pan, heat 1 tablespoon olive oil and saute shallot; cool. Measure Parmesan. Prep tomatoes, scallions, parsley and basil. 2 Gently unfold pastry on lightly floured 12-inch square of parchment paper, roll out pastry to 11-inch square. Trim edges to make 10-inch square. Transfer pastry on parchment to an ungreased 17x11x1-inch baking sheet. Score edge at 1/2 inch; prick pastry thoroughly with a fork inside the scored edge. 3 Spread shallot and oil over pastry. Sprinkle Parmesan over pastry. Combine scallions, basil, parsley, 1 tablespoon olive oil, pinch of salt and 1/8 teaspoon pepper; scatter evenly over tart inside the scored edge. Place cherry tomato halves, cut side up, on tart; sprinkle with a pinch of salt and 1/8 teaspoon pepper. 4 Bake at 425 degrees for 20 to 25 minutes, or until crust is golden. Transfer to wire rack to cool for 10 minutes before *cutting and serving. Cut into 4 pieces for a lunch serving, 8 for a first course serving, or into small squares for an hors d'oeuvre or afternoon tea savory. Serve warm or at room temperature. * I've used the OXO Good Grips Pizza Wheel for Non-Stick Pans for years on this as well as pizza, and it cuts like a dream! Thanks, Judy! I'm making it again on Sunday. Can't wait! I love tomatoes whether they are the tiny cherry tomatoes you have used in this recipe or the giant beefsteak tomatoes that you can slice into large thin ovals.I put tomatoes into salads all through the summer with a honey and mustard dressing.I love to include a lot of watercress with it's sharp bite too. Some nice slices of honey roast ham and some jersey potatoes glazed with butter!!!! Am I just being English, with the above concoction? Ha! Ha! Your recipe sounds absolutely terrific as usual Jean. Thanks, Tony! That salad sounds like a lovely combination. Wish I was having some right now. I adore watercress! Oh my gosh those are amazing looking!! I'm going to try and grow cherry tomatoes this next season. I hope I can get as big of a bounty as you did!! Thanks, Jenn! Next year I'm going to plant one cherry tomato and one regular tomato. I'm not sure if the great success with cherry tomatoes this first time is due to the nature of the cherry tomatoes or to my having hit on the perfect spot in my backyard. what a lovely set you have! Look at that plate! Jean, your juicy tomato tart looks irresistible. I love the idea of using readymade flaky puff pastry. Angie, thank you. I find anything with a pastry crust irresistable! Tried hard not to like this, but you won me over. I think my problem was that, in principle, anything with a shell/crust/floury base to present it upon begs for something sweet, in my mind and on my taste buds. Moreover I eat vegetables mostly as penance. But I’m thinking your recipe has real tang in it, and tang is right behind sweet in the pecking order. White flag and four cleavers! Sully, four cleavers? Thanks! Tangy IS good, sometimes even better than sweet, and this definitely has tang. My dear husband tried hard not to like it too (he calls HD things "silly crap food"), but just couldn't help himself! These look delicious - I am printing this out to try! Thank you, Bernideen! Let me know how it turns out for you. I don't know why, but I can't stand warm tomatoes. Cold tomatoes, tomato sauce are okie dokie. Well, we all have our little quirks, Mrs T! Like mine with coffee - I like hot coffee and I like coffee ice cream, but I have an aversion to iced coffee.